1. Tailgate in the same parking lot as ski-film icon Warren Miller. Ten years after the installation of the first ski lift, a young buck by the name of Warren Miller parted ways with the US Navy, packed his 8mm film camera, and hauled a teardrop trailer to the mountains of Idaho in pursuit of the ski-bum dream. Today that same essence lives on, and while you may find fewer diehards living out of their cars these days, the ski stoke vibe that Miller was so captivated by can still be found at Sun Valley’s River Run Lodge, and stories of “how deep it really was” are still told on the tailgate over a cold Coors Banquet beer. Bring a six-pack to share and feel it for yourself. 2. Cross-country ski the US Olympic training grounds. There are over 125 miles of endorphin-inducing, visually stimulating cross-country terrain in the Wood River Valley. A US Olympic training site since 2012, the Sun Valley XC trail system may be home to the elite, but its groomed landscape provides sweet tracks for any skill level. Take time out for a drink and a bite to eat at Galena Lodge, no matter how good your crossover turns look. 3. Eat fondue at 8,000 feet. 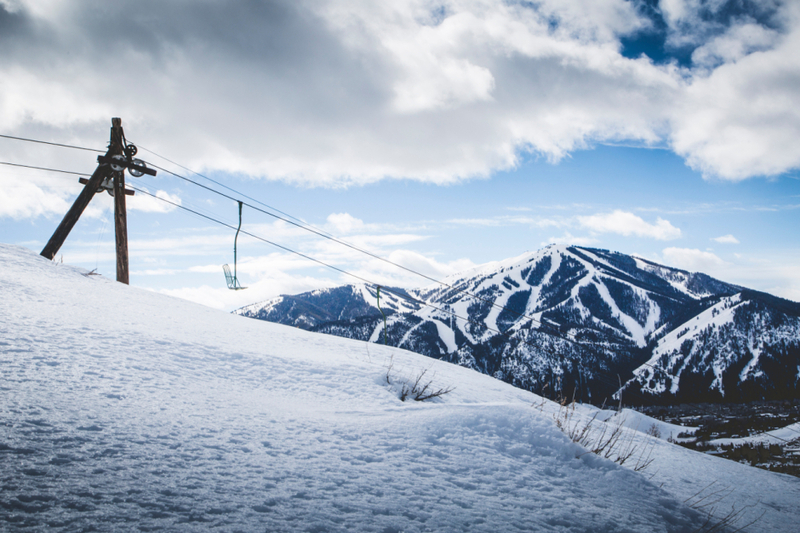 Jump in Sun Valley’s new gondola for the ride up to Roundhouse Lodge, the country’s oldest ski lodge. Order a caquelon of white wine, shallots, and melted Gruyère, dip in a warm baguette, and you’ve got yourself the perfect gourmet mid-ski snack. Located within the lodge, Averell’s Bar has 8,000ft panoramic views of the Pioneer Mountains, making it the ideal spot to kick off the ski boots and recharge for the remainder of the day. 4. Check out five mountain ranges from the top of Baldy. 5. Rub elbows with celebrities and skiing legends. Do you feel lucky? Well, you should — the odds of sharing a lift with a legend around these parts is on par with winning ladies’ night bingo at the local 4-H club. Sun Valley has been a favorite destination for famous faces and skiing legends since Hemingway holed up here in the 1930s. 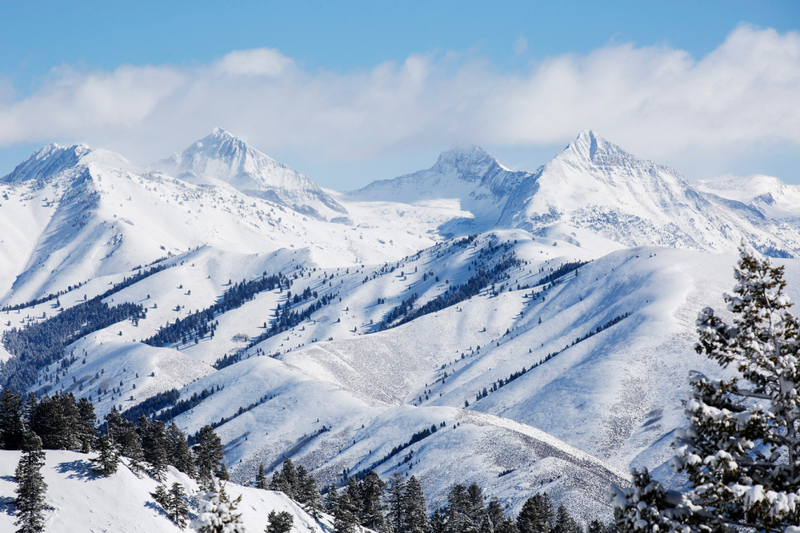 Today Clint Eastwood, Arnold Schwarzenegger, Tom Hanks, and Bruce Springsteen are just a few stars that make Sun Valley their ski town of choice. Why? We reckon they’re into the small-town vibe that lets them fly under the radar and enjoy the mountains like everybody else. 6. Fish trophy trout waters. 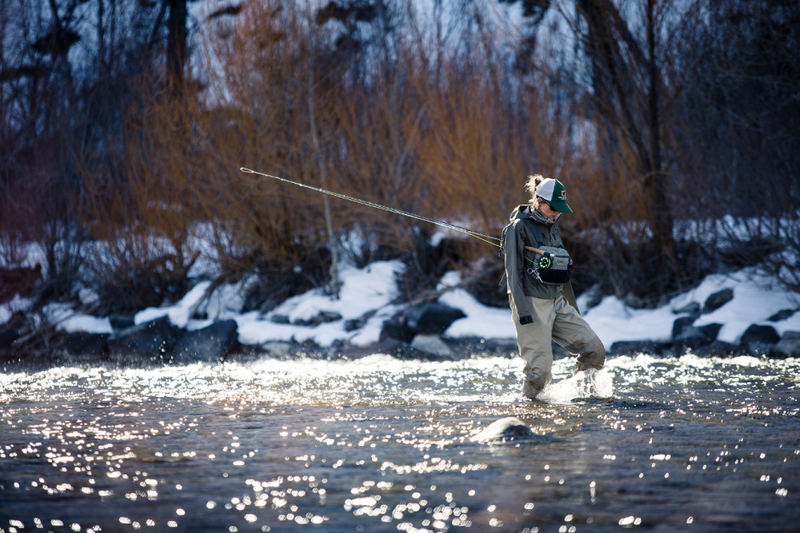 Between the comforts of your rig and the swanky accommodations of the Sun Valley lodges lies a freestone river holding some of the valley’s most prized possessions. Considered by many to be one of the most productive fisheries in the West, the Big Wood River harbors a slew of healthy rainbow and brown trout. Leave the ski boots on and swing a few drifts on your lunch break for a chance to feel the tug from one of these high-mountain beauties. 7. Grab an afternoon heli lap from the top of Baldy. It’s nearing midday and you realize you’ve thoroughly exhausted the two-day-old powder stashes. 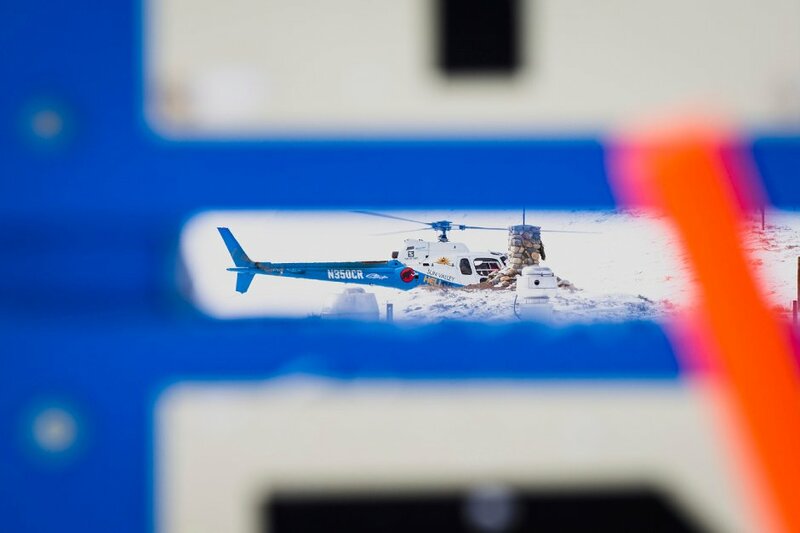 Time to call up Sun Valley Heli Ski to track down some pristine, untouched fields of glory. Founded back in 1966, these guys offer pickup from the tiptop of Baldy out to one of three nearby mountain ranges, and they’ll happily share their extensive knowledge of aerial-assisted skiing for an unforgettable afternoon on the slopes. 8. Soak in a bit of ski racing culture at Apple’s. 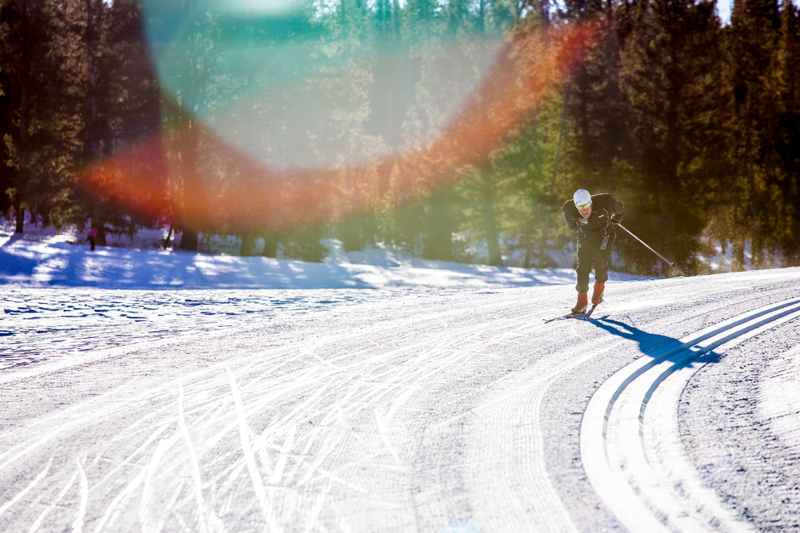 Sun Valley’s ski culture runs deep, and one of the longest standing and most celebrated factions is the downhill ski racing community. The steeps of Bald Mountain have shaped a copious number of ripping skiers, with several going as far as the Olympic arena. At the bottom of the Warm Springs side of the mountain, Apple’s Bar & Grill is an après-ski hotspot. Order a beer, check out the iconic memorabilia, and keep your eyes peeled for local racing legends like the Crist brothers. 9. Skin to the top of one of the world’s first ski lifts. Back in 1936, a gentleman by the name of James Curran adapted a banana conveyer belt into the world’s first ski lift. Sun Valley set the stage for this revolutionary piece of machinery that would forever change the face of skiing. Today, one of the three original lifts still stands atop Ruud Mountain, and a quick snowshoe or skin will place you on the sunny slopes that host this historic structure. 10. Take flight over the mountains. 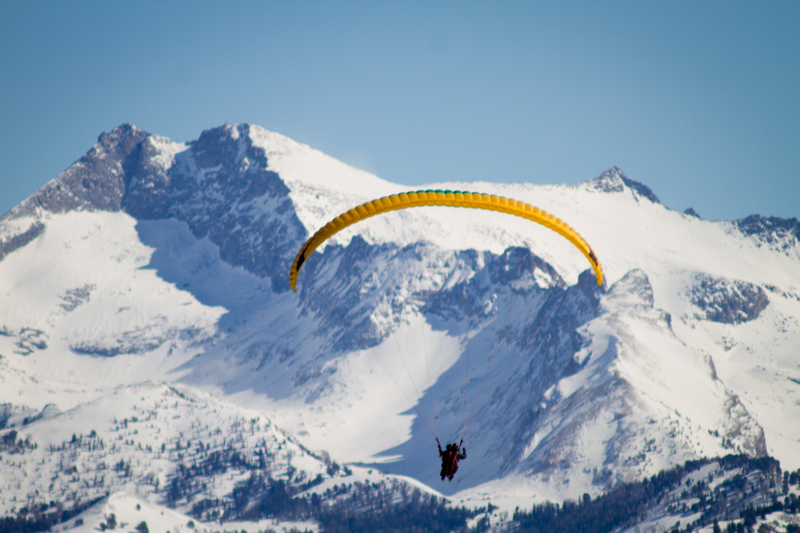 Three, two, one, liftoff… Feet dangling, wind rushing across your face, and a bird’s-eye view encompass the experience of paragliding off the top of Bald Mountain. Fly Sun Valley takes flight four times a day (conditions permitting), delivering a near-weightlessness ride accompanied by aerial views of the Wood River Valley below. It’s the closest thing to being reincarnated as a raven dancing across the mountain thermals you’ll find in this lifetime. Photos and story originally published on Matador Network. Click the link to view the original story and a whole bevy of other awesome travel ideas.